In establishing General Ratko Mladic’s guilt, the Prosecutor defines the accused's role in the context of Commander and indeed architect of Belgrade’s action-plan and its execution in Bosnia & Herzegovina, whether formally acting as head of the JNA (Yugoslav National Army), or, after simply changing insignia, as Chief of the Republika Srpska Army. However, it appears no institution on whose behalf Mladic has acted will be held accountable, and the victims of his crimes are left to be satisfied with mere words of condemnation. What would be the consequences for those so directly harmed of a guilty verdict regarding General Mladic? The crimes and harm committed was done with purpose of plan sponsored by Milosevic’s Belgrade, effectively unchallenged/acquiesced to by the international powers and even today left in tact as fruit of the genocide executed by Mladic’s forces. The UN, US, UK, France, Netherlands and every other nation and multilateral institution has either claimed sovereign immunity or similar argument to reject any responsibility toward the victims. While the Netherlands in word has accepted some fault, in the very specific betrayal of Srebrenica and Zepa, Washington and the big European capitals continue to even acknowledge the “deals” done in their name by their officials to handover these UN “safezones” and NATO “protected areas” to Milosevic and Mladic’s killers. A drunken taxi-driver plowing into a school crosswalk may have more of a defense as to the consequences of his actions. Here again though the victims of Mladic’s genocide are told to comfort themselves with the conviction of the man but neither the plan nor most critically its consequences. Bosnia & Herzegovina had also brought a case against Serbia/Montenegro for genocide. However, with the explicit purpose of shielding Belgrade from responsibility/damages, the most relevant evidence was not delivered from the ICTY (International War Crimes Tribunal for the former Yugoslavia) to the ICJ (International Court of Justice) where the case was heard. (Why the evidence was not delivered continues to be a point of contention between the two institutions, but the Bosnia/Herzegovina victims and state are left holding the empty bag of remedies). A cause of action on behalf of victims against Republika Srpska may also be in order. However, since and beyond the Paris-Dayton Accords (in which I also participated), the Bosnians/Herzegovinians were lectured that territorial accommodation to Mladic’s ethnically cleansed map was a necessity to end the war/genocide. Indeed, we were informed that if we did not accept then Bosnia & Herzegovina would be blamed for responsibility for the perpetuation of the conflict, the sieges (including Sarajevo) and the effective continuation of ethnic cleansing. The same logic continues to be pressed today upon Bosnia & Herzegovina's citizens and leaders to accept the status-quo of Mladic's map. So whom do the victims of Mladic’s crimes look to for substantive relief? 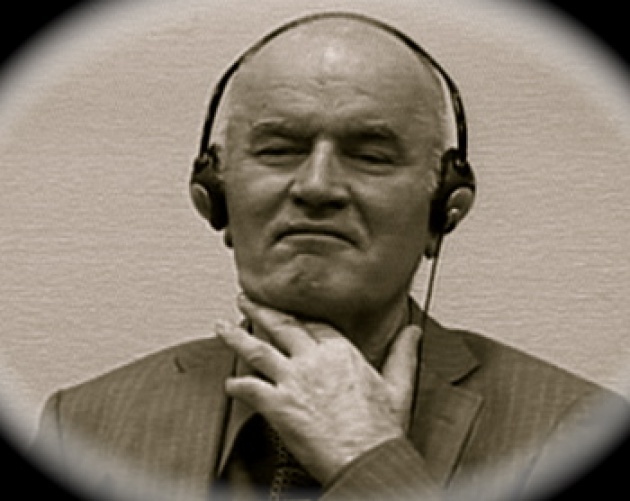 Mladic smirks and gestures a cut-throat sign, (Photo Above), still proud of his deeds and conveying the message that his plan has succeeded regardless of the inevitable verdict of guilt. Ironically, as Mladic’s trial starts, the guardians of Paris-Dayton Accords in effect put another stamp of approval upon Mladic’s fruit-the refugees/displaced persons ethnically cleansed by Mladic will from now on be deprived of voting in their municipalities of origin. Read our Blog for Film: “Now Completing Mladic’s Genocide in Srebrenica, Prijedor…”. Of course, many either fear or cannot go back as those actively working to finish Mladic’s action-plan are in positions of political, economic, social and/or law enforcement authority. As the BBC's Allan Little emphasized: Mladic's actions were "state sponsored" and that still continues today in Republika Srpska. I have respect for the effort/work of those prosecuting Mladic before the ICTY. However, they and I know that Mladic’s guilt is purposeless unless victims realize a clear remedy, at least relief that counters the fruit of Mladic’s crimes and map. Then, we would finally have the door open to real peace and a sincere welcome to reconciliation.